Discover the secret to a deeper understanding of ourselves and our true potential. 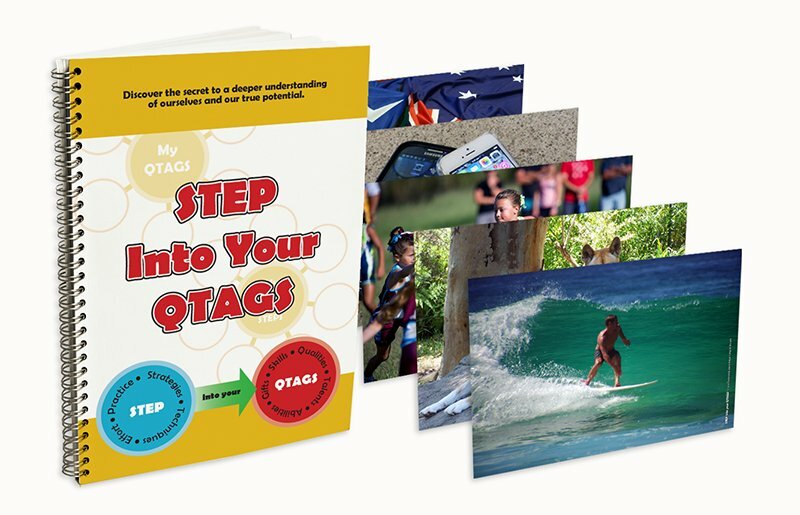 The STEP Into Your QTAGS program is designed to assist in strengthening and developing the inner self by reflecting on the Qualities, Talents, Abilities, Gifts and Skills that we acquire throughout life's journey: QTAGS. The activities in the STEP Into Your QTAGS program can assist in strengthening our own QTAGS by exploring those found within the images. All QTAGS are positive. They are the best parts of us. They are intertwined with, and influenced by, our feelings and emotions; attitudes and values; our spirituality and our moral compass. They make up our personalities. All of these things make us the individuals that we are, whether we are born that way or we become that way as we develop and grow. The environmental influences of life's journey can hide our QTAGS inside us. Whether recognised and nourished, or ignored, they are innate in all of us. It is up to us to identify the natural QTAGS that we possess, and to nurture and develop them to assist us in reaching our true potential; learning to use them to our advantage throughout our journey in life. Written from a group perspective enabled by a group facilitator, the STEP Into Your QTAGS program is also suitable for working in pairs or as individuals, but is applicable to varied audiences, be they young people or Elders. Some of the activities may lend themselves to a younger audience; others may fit better with a more mature audience. Purchase online or contact Lee at the Yarning Circle by email or phone if you require more information regarding STEP into your QTAGS™. STEP into your QTAGS™ is a trademark of The Yarning Circle®.